College of Europe Alumni Association | Asian National Week 2018 at the College! On the afternoon of 15 January 2018, as the kick-off cultural event of the Asian week, students gathered to enjoy the Chinese traditional paper cuttings at the Chinese-style China Library in Verversdijk. The Chinese friends prepared small souvenirs – which are known to bring good luck in China – and also snacks like Chinese tea and Chinese noodles. More than 30 College of Europe students joined this movie night at the Oliebaan Residence, on 16 January 2018, to watch the famous film "The Grandmaster" directed by WONG Kar-wai. This film introduced the poetic beauty of martial arts, while bringing out the experience of living through the Japanese invasion of China during the World War II. 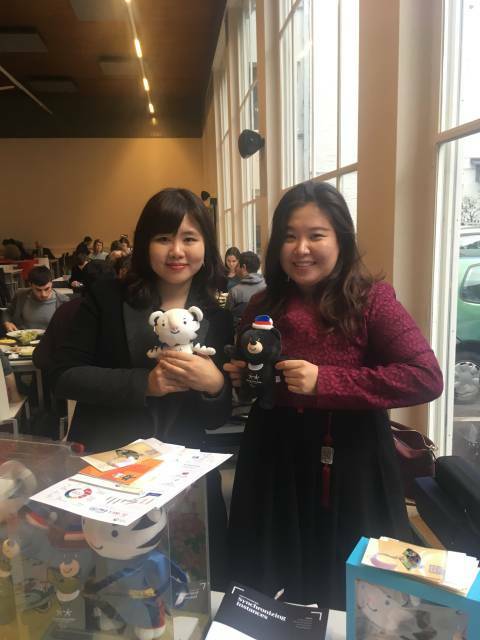 As the last marking events of the Asian week, a marvelous Korean lunch was served on 18 January 2018, at Garenmarkt. The lunch was made in cooperation with marvelous canteen staff who prepared the "Bibimbap", Korean mixed rice with vegetables and meats. Also with the generous sponsorship of the Embassy of the Republic of Korea in Brussels, the students enjoyed "the Taste of Korea", one plate of all 4 different dishes (Mandu, Korean Fried Chicken, Tteokbokki and Kimchi). Students who visited the Korean Booth at the canteen were able to get beautiful souvenirs of Korean traditional bookmarks and also find information in many brochures about the 2018 Pyeonchang Winter Olympic, the working holiday in Koreaand the programs of the Korean Cultural Center. Contacts: The students of the organizing team were Shiyao WANG, Lefei YIN, Mengqi ZHOU for the Chinese part, and Bareun CHOI for the Korean part.